Getting your Power BI report exported into PowerPoint is quick. Just follow the steps outlined in the next section. 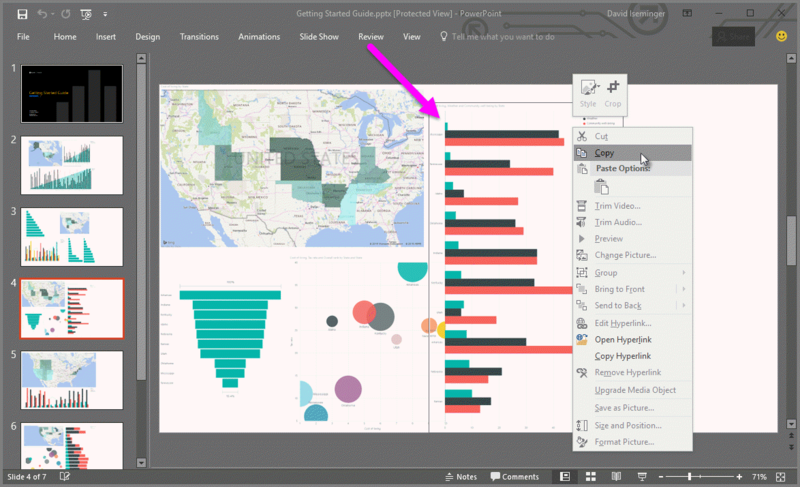 In the Power BI service, select a report to display it on the canvas. You can also select a report from your Home page, Apps, or any other section on your left navpane. When the report you want to export to PowerPoint is displayed on the canvas, select File > Export to PowerPoint from the menu bar in the Power BI service. A pop-up will appear where you have the option to select the Current view or Default view. Current view exports the report in the current state, which includes the active changes you made to slicer and filter values. Most users select this option. Alternately, selecting Default view exports the report in the original state (as the author shared it), and doesn't reflect any changes you made to the original state. Additionally, there is a checkbox to select whether or not to export the hidden tabs of a report. Simply check this box if you would like to only export report tabs that are visibile to you in your browser. If you'd prefer to get all the hidden tabs as part of your export, you may leave this unchecked. If the checkbox is greyed out, there are no hidden tabs in the report. Once you have made your selections, click Export to continue. 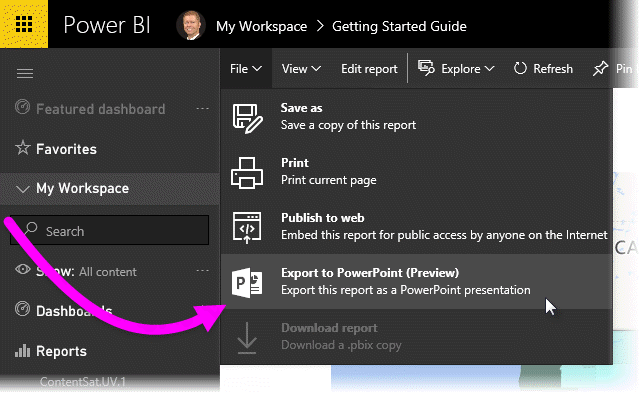 You'll see a notification banner in the upper right corner of the Power BI service browser window that the report is being exported to PowerPoint. This might take a few minutes, and you can continue to work in Power BI while the report is being exported. Once complete, the notification banner changes to let you know that the Power BI service has finished the export process. Your file is then available where your browser displays downloaded files. In the following image, it's shown as a download banner along the bottom of the browser window. And that's all there is to it. You can download the file, open it with PowerPoint, and then modify or enhance it just like you would any other PowerPoint deck. When you open the PowerPoint file that Power BI exported, you find a few cool and useful elements. Take a look at the following image, then check out the numbered elements below that describe some of those cool features. The first page of the slide deck includes the name of your report, and a link so that you can View in Power BI the report on which the slide deck is based. 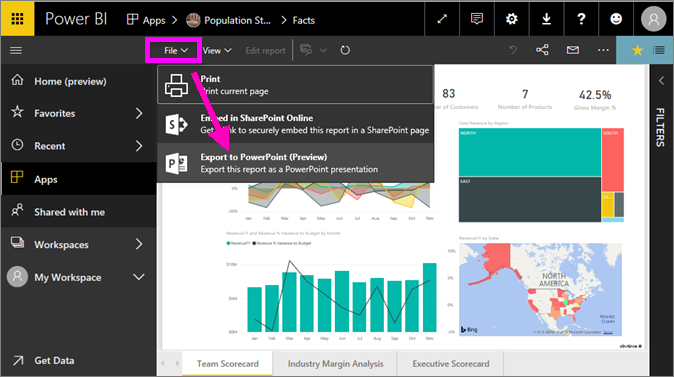 You get some useful information about the report, too, including the last data refresh on which the exported report is based, and the downloaded at time and date, which is the time and date when the Power BI report was exported into a PowerPoint file. Each report page is a separate slide, as shown in the left navigation pane. Your published report is rendered in the language according to your Power BI settings, or otherwise by the locale setting of your browser. To see or set your language preference, select the cog icon > Settings > General > Language. For locale information, see Supported languages and countries/regions for Power BI. The PowerPoint presentation includes a cover slide with the exported time in the correct time zone. When you go into an individual slide, you'll notice that each report page is an independent image. Having one visual for each report page is new behavior. The previous behavior, which provided an independent image for each visual, is no longer implemented. What you do with your PowerPoint deck from there, or any of the high resolution images, is up to you! There are a few considerations and limitations to keep in mind when working with the Export to PowerPoint feature. R visuals are not currently supported. Any such visuals are exported as a blank image into PowerPoint with an error message that states the visual is not supported. Custom visuals that have been certified are supported. For more information on certified custom visuals, including how to get a custom visual certified, see getting a custom visual certified. Custom visuals that have not been certified are not supported, and are exported as a blank image into PowerPoint with an error message that states the visual is not supported. Reports with more than 30 report pages can't currently be exported. The process of exporting the report to PowerPoint may take a few minutes to complete, so please be patient. Factors that can impact the time required include the structure of the report, and the current load on the Power BI service. If the Export to PowerPoint menu item isn't available in the Power BI service, it's likely because your tenant administrator has disabled the feature. Please contact your tenant administrator for details. Background images will be cropped with the chart's bounding area. It's highly recommended that you remove background images before exporting to PowerPoint. 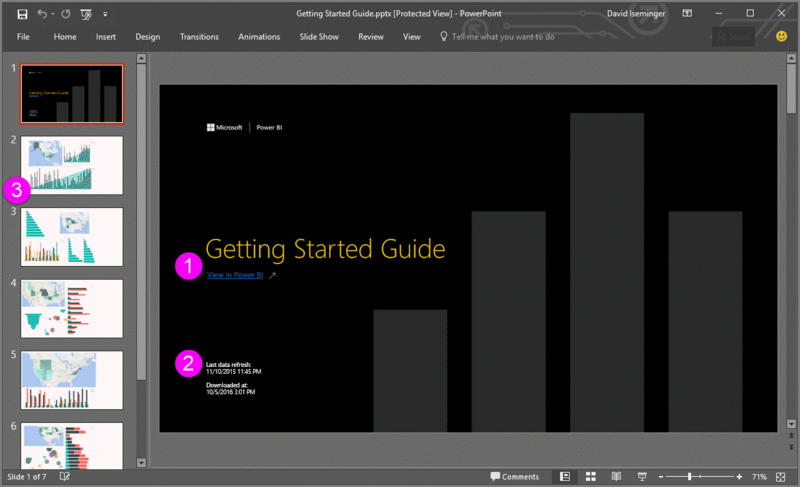 Pages in PowerPoint are always created in the standard 9:16 size, regardless of the original page sizes or dimensions in the Power BI report. Reports that are owned by a user outside your Power BI tenant domain (such as, a report owned by someone outside your organization, and shared with you) cannot be published to PowerPoint. If you share a dashboard with someone outside of your organization (and thereby, a user who is not in your Power BI tenant), that user will not be able to export the shared dashboard's associated reports to PowerPoint. For example, if you are aaron@contoso.com, you can share with david@cohowinery.com. But david@cohowinery.com cannot export the associated reports to PowerPoint. Export may not work with older versions of PowerPoint. As previously mentioned, each report page is exported as a single image in the PowerPoint file. The Power BI service uses your Power BI language setting as the language for the PowerPoint export. To see or set your language preference, select the cog icon > Settings > General > Language. The Downloaded at time on the cover slide for the exported PowerPoint file is set to your computer's time zone at the time of the export. URL filters aren't currently respected when choosing "Current Values" for your export.